I have been told I have the heart and temperament of a child, and if you’ve been around me when I see a sweet-faced puppy (or really any animal), you know exactly why. Every single time, without fail, my eyes light up with genuine excitement and I tend to squeak and say silly things without thought. My reaction is pretty similar whenever I see a cool piece of technology, “Eeeek! That is so awesome!” Yes, I am 25 years old and okay, maybe I’ll never really grow up, but that’s okay with me. (I think Popeye the Sailor Man summed it up pretty well: “I yam what I yam, and tha’s all what I yam.”) But honestly, how can one not grin at the sight of a fluffy animal, or when learning about something extraordinary in the field of technology? I have always been fascinated with technology and my enthusiasm has greatly expanded since working with the INDATA Project. Prior to becoming INDATA’s social media content specialist, I never paid much mind to assistive technology. After all, I have used a form of assistive technology every single day for a majority of my life; I suppose you could say it was something I’d often take for granted. Because I grew so accustomed to it, especially my power wheelchair, I never saw assistive technology as a big picture and how essential it is for other persons with disabilities. I now am aware of several technologies to help those with visual, hearing, or mobility impairments, as well as technology to help individuals with other disabilities such as autism. I dedicate my time doing hours of research on the latest advancements in the field of assistive technology, as well as writing informative blogs on my findings in hope to simplify the lives of individuals with disabilities. In my opinion, today’s blog covers several technology advancements, with a focus in the field of robotics–and its significance among the human race, especially those with disabilities. This past weekend, I saw Big Hero 6, the new Disney movie featuring (the very adorable!) 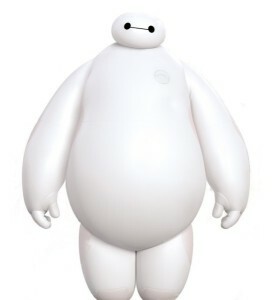 Baymax, an inflatable robot designed for caregiving. Throughout the movie, there is a special bond that develops between Baymax and 14-year-old Hiro Hamada. As a whole, I felt the movie perfectly conveyed how much technology (i.e. a robot) can positively influence humans. I often found myself wanting to hug the big, marshmallow of a robot. So I asked myself, does such a robot exist? Soft robotics provide a number of real-world benefits, some of which are illustrated in Big Hero 6. The human-robot interaction found throughout Big Hero 6 is no longer a fantasy, but rather a very likely future here and around the world. Soft robotics is still developing as a field, but throughout the past several years, there have been a number of other robots introduced to benefit an individual’s physical and mental health. The NAO robot (pronounced now) was developed by Aldebaran, a company specializing in humanoid robots to benefit humans in a myriad of ways. 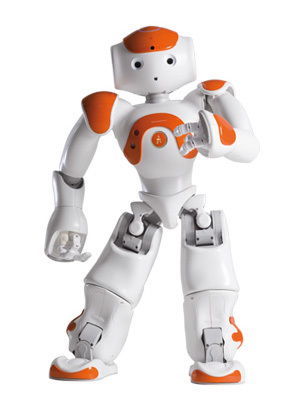 NAO robot is a major breakthrough for children and adults alike, especially those with autism. Children with autism often never engage with the therapist, so NAO is a great way to grasp a child’s attention. The robot is very consistent and never gets tired or judgmental, and these facts alone make it a great resource for use in therapy. For more information on NAO, visit the NAO website. 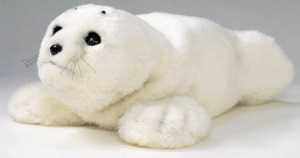 PARO is a little different from many robots available on the market today as it is designed primarily to serve as a therapeutic robot, especially for the elderly. It is an advanced interactive robot developed by AIST, a leading Japanese industrial automation pioneer. It is developed to provide the same benefits as animal therapy, but can be utilized in environments such as hospitals and extended care facilities, where live animals aren’t an option. It’s also ideal for individuals who cannot take care of live animals, but who still want that companionship. PARO has five kinds of sensors: tactile, audio, temperature, light, and posture sensors, all which help it perceive people and its surrounding environment. With these five sensors, PARO can recognize being stroked and being held; recognize light and dark; recognize the direction of voice and words such as its name, greetings, and praise. Back in February in the Robots4Autism blog, I covered robots specifically designed to help individuals with autism. 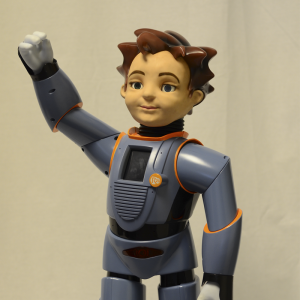 Robots4Autism blossomed from RoboKind, a leader in the industry of robotics. After years of experience with robotics, they began to note how robots benefit individuals with autism. The robotic experts collaborated with several autism experts, and after nearly a decade of research and collaboration, they came out with Zeno: The Social Robot, which uses innovative robot-generated instruction to improve a child’s social behaviors in a natural context. It was briefly inferred in the NAO section above that many children may not improve their social behaviors by interacting with another child or adult due to stress and frustration, thus their social skills may suffer. However, with Zeno: The Social Robot, children have the ability to simultaneously interact in a natural, more thrilling context while working on their social skills, all without the stressors common among human interaction. With Zeno, children are intrinsically motivated and engaged at a much faster pace compared to other therapy practices. Multiple sensors to detect touch, faces, track motion, etc. Estimates and confidence values can be delivered to a facilitator to assist with real-time decision making. The INDATA Project at Easter Seals Crossroads is dedicated to helping individuals with disabilities by spreading awareness of assistive technology and the services we offer. We acknowledge the benefits of technology, especially in the field of robotics, and are very excited to introduce you to our new project. Introducing ARTI at Easter Seals Crossroads! There are several great resources already available to help individuals with all sorts of disabilities, and we are always looking for the next big thing. Stay tuned to learn more about ARTI and other assistive technology projects! Jazz up therapy with the MusicGlove!